Better protection? Rugged good looks? Increased off-road capabilities? Integrated light mounts? Whatever your reasons for upgrading to an aftermarket unit, the Backwoods Nomad Mercedes Sprinter front bumper has you covered. 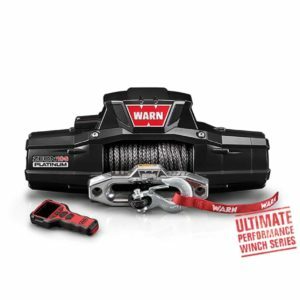 The aluminum construction minimizes the weight penalty, while the steel mounting structure provides the strength necessary for the winch mount, shackles, and receiver hitch. Four well-placed cutouts are ready-made to house Rigid Industries D-Series LED pods, and the E-Series LED lightbar integrates perfectly with the optional bull bar. Add on the DEF tank skid plate and your Sprinter’s front end will be completely protected and ready for next adventure. Expect 3-6 weeks for delivery. Free shipping (US only) to commercial locations with loading dock. Non-commercial locations subject to $100 freight surcharge. Contact us for details. *Custom paint options, lighting & winch packages available. Fit Note: Results may vary when moving the CPA sensor from the OEM location. Drive with care until you have verified that the system functions correctly. Adjustments may be necessary. We cannot guarantee our product is compatible with this system.